Following in the footsteps outlined in Shackleton’s Forgotten Expedition, Lynn takes the controls as we head north along McMurdo Sound toward our Winter Quarters below Mount Erebus. Five weeks and 5000 kilometers later, the final countdown for our time in New Zealand has finally arrived. We would have liked to stay longer but, due to a ticketing problem in our planned departure from Sidney Australia, we had to take a defined departure date. To make a change at this late date would have been far to expensive. 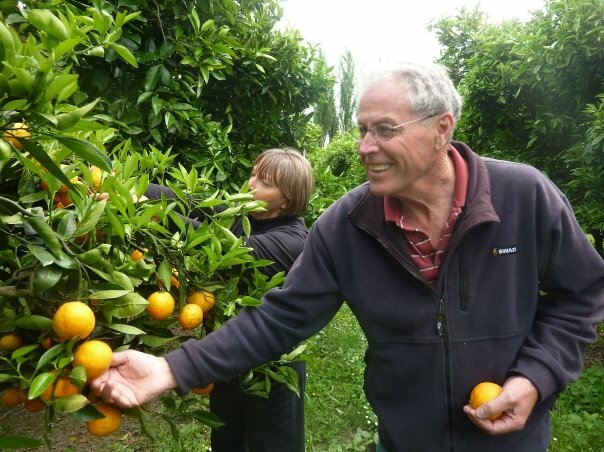 Our last few days are spent traveling up the East Coast from Invercargill through Dunedin where we visit the Lloyd family (Kim, the oldest daughter of our friends, David and Gill, and Kim’s husband Hywel and their two children – pictured in Rotorua story). After a short, but wonderful visit, we again head north along the coast toward Christchurch, making several stops along the way. In scanning the slideshow you will note a group of amazing rocks, the Moeraki Boulders that look like giant cannonballs. Located at Koekohe Beach along a short stretch of the Otago coast, these boulders were formed millions of years ago in the Pleistocene era and only after millions of years of erosion have they made a surface appearance. Each decade more rocks have become exposed and it appears this is the only area in the world where these unique rocks can be found. 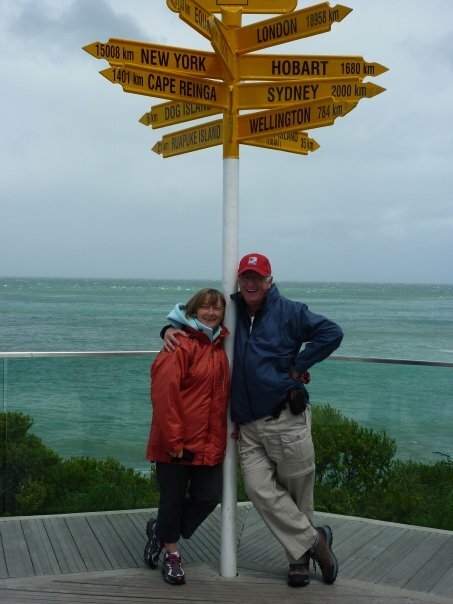 While in Switzerland, Lynn and I struck up a friendship with Karen and Nobby, a couple who hailed from Invercargill — the very southern tip of the South Island of New Zealand (next stop Antarctica). Some weeks after the meeting in Switzerland, and just by pure chance, we ran into Karen and Nobby again in Venice, totally unplanned, in the midst of a crowd that must have numbered in the hundreds of thousands. Can you imagine the coincidence? Meant to be we figured and that we had best accept their invitation to visit their plantation in New Zealand! Well, that future came much sooner than expected when Lynn and I made the trek to Invercargill in late November, 2009. So where does one start to tell the story of our visit with Nobby and Karen? Well, I suppose, I will do what Nobby would do in such a situation – just “tell it as you see it”. At one moment, Nobby is overwhelming a conversation with some witticism and the next he is in an engaging in conversation that demonstrates a wide knowledge of the world and of many interesting subjects. While in Rotorua, Lynn and I decided to “scoot” over to Gisborne to pay a quick visit to the McKenzie family. The mom, Carmelle, is sister of our niece, Meryl Yochim who lives in Gold Canyon, AZ with her family. “Scooting” over to Gisborne or anywhere in NZ for that matter is not that simple for in NZ the rule of “two kilometers forward, one kilometer sideways” applies to the most scenic routes and the “Waioeke Gorge” is no exception. While the Gorge road is only some 50 to 60 kms in length, it only covers about 30 kms as the “crow flies”. Lynn loves the switchbacks, particularly when she is seated on the drop side of the road. 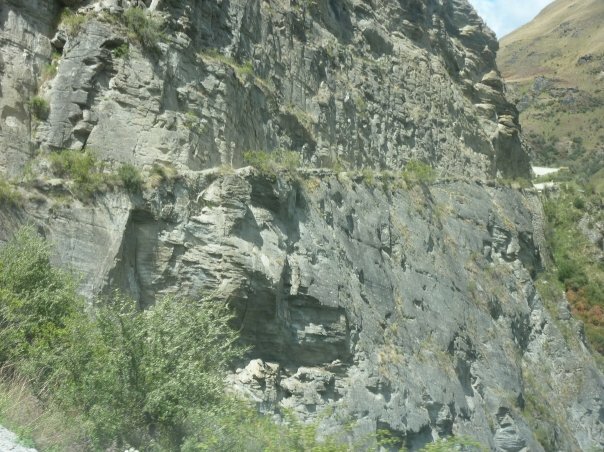 The only two alternative roads to Gisborne were the Northern coastal route and the Southern mountain route – either of which would have very scenic but would have taken hours longer. Photo: Parts of the road that do not wander along a cliff face are contained within a green curtain of vegetation. As we moved out of Waioeke, we entered gently rolling hills – home to many sheep and cattle farms. The countryside slowly wound down to lush fertile flatland enroute to Ormond and Gisborne. Here we found row upon row of grapes, citrus and other field crops interspersed with fields reserved for grazing cattle and sheep. The fields were bordered by trees planted and pruned as windbreaks to protect the grape vines and fruit trees from wind damage. This shot provides a view of the road on the opposite side of the valley as we proceed around a band. In many places the road clings to the cliff anywhere from 500 to 2000 feet above the Shotover River. Link here for full set of photos. In Queenstown Lynn and I booked for a trip to the Shotover River. This was listed as a “Jet Boat River Ride” but, as it turned out, the real adrenaline rush was the one hour and fifteen minute four wheel drive to reach the river launch site. For the trip our driver and guide, Craig, a young man who has made this trip dozens of times, was one of those people that truly make a trip special. I managed to snag the “shot-gun” seat but fifteen minutes after leaving the secondary for the gravel mountain road I was not so sure it was the seat I wanted. Lynn was right behind me in a single seat and if she had a choice I am sure she would have abandoned the trip. Although I took dozens of pictures (it kept my mind off the drop) it was hard to capture this road in two dimension. I wish I had used the video feature on my camera. As we wound our way into the moutains we climbed from 500 to 2000 feet on a single lane gravel road that was barely wide enough to negotiate with our four wheel drive bus. In many areas Lynn and I were on the cliff side and you could not see the road below our window. The river would be our first stop if the side suddenly caved away or the driver made a misstep. You must also remember this is a two way regulard NZ highway (see the road sign photo) with the usual rules – speed 80 km – you’ve got to be kidding. If you meet another vehicle, in most places you cannot pass as the road is only one narrow lane, therefore one vehicle must back up until you reach a section that will allow the pass. As you pass, one vehicle pulls to the cliff edge and the other squeezes by on the cliff side. Anyone, even a new driver, can take to this road and we heard that on a few occasions drivers simply abandoned the trip as it would take (I am sure) nerves of steel or the fearlessness of youth) to actually drive on this road. The road continues for what seems forever until we finally wind down into a valley to catch the jet boat for a further ride up the river. The boat ride at high speeds through screaming turns seems positively tame compared to the road trip. On the river we pass the location of the river flood scene in the “Lord of the Rings” and do several high speed 360 degree turns along the route. Returning from the jet boat, Lynn and I seriously considered catching a “chopper” ride out as it provides regular service for those bus riders who might choose an alternative route out but opted for the bus as we did not want to bail on Craig. Several people from our bus waited for the chopper. Not wanting to be a seat hog, I checked to see if anyone else might wish to ride shotgun but there were no takers. Lynn and a couple of the passengers asked me not to talk to the driver (a nervous reaction on my part) as he always choose to look at me when he answered and I suppose they figured he should be watching the road. Craig tells me that for years he has wanted to become a pilot and while I encouraged him to live his dream, I cannot imagine how flying would provide any greater thrill than taking this bus through that mountain road several times a week. When we finally reached the paved road the muscles in my legs ached after compressing the floorboards for over an hour. Lynn was still in a state of shock but I suspect she will now consider a normal paved mountain pass switchback road, like those in Canada, to be rather mundane. I also think she might even consider a parchute jump to be OK as it would be over in less than five minutes. The weather continues to clear and warm as we move inland toward Queenstown. The mountain roads present incredibly beautiful scenes that would rival anything we have seen elsewhere in the world including Canada. While the roads are very good, we must continue to negotiate switchbacks that always take us two kilometers forward and one kilometer back. The nice part of this is that it gives you a chance to see every scene from a 360 degree perspective. We pass through gold mining towns and sheep stations that provide us with some insight into the challenges faced by early settlers that first moved into this area. I don’t think even the local Maori people even spent much time in many of these areas. We take a secondary highway through a place called Cardrona and not long thereafter navigate a mountain pass that is reported to be the highest paved road in New Zealand. We stop at a pullout near a lone dead tree and continue on foot, climbing another 500 meters on mountainsides covered with tussock grass. Along the way we pass one small communite called, of all things Athole, another called Bush! Apparently someone loved one of the US Bush boys as they removed Pine from the name. 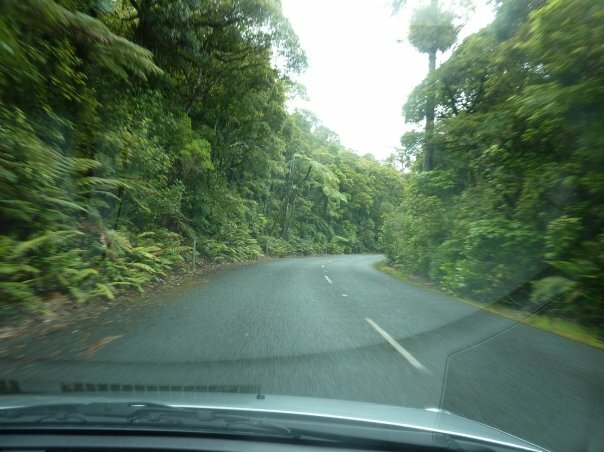 Our travels in the North Island have pretty much wrapped up and we are now headed south. The weather turned blustery as we near Wellington and continued for several days through to the Fox Glacier. The ferry was as modern as any we have in British Columbia however the waters through which it travels is subject to severe storms. The ferry crossing was rough as you will note in the photos but we snagged front row seats in the passenger lounge with movie and, if we had wished, alcoholic drink. None of this dampened our spirits as there were so many sites to see. Once off the ferry, we travelled south along the West Coast on roads that were almost devoid of traffic. Throughout NZ there are hundreds upon hundreds of one way bridges each of which has it’s own personality and the switchbacks on the narrow mountain roads have now become a way of life. It seems that the north part of the South Island provides challenging life for those who desire to live in that rather remote area. As about 75% of Kiwi’s live in the North Island and the majority of those who live in the South Island occupy the main cities along the more temperate East Coast. Never-the-less these hearty soles are a most welcoming people and no matter were we stay we always end up meeting people anxious to know more about Canada and Canadians and each of whom are eager to share a bit of their life story. “He kakano ahau, ruia mai i Ranglatea” (I am a seed, scattered from Raniatea) and so Lynn and I entered “the magical world that was home to the Patu-paikarehe fairy people who lived off the products of the forest and the inanga (whitebait) that thrived in Lake Rotorua” (Fairy Folk of the Ngongotaha Mountain by Mrs. EC Cowan). It has taken us over fifteen years, but we finally arrived in Rotorua to visit with David and Gill Russell and were made to feel as welcome in the Russell home as at any home in our lives. Over several days, we shared stories and pictures of our families and lives. David and Gill also compiled a list of attractions to visit while in Rotorua. This city of 68,000, which attracts over 3 million visitors per year, is a wonderland of tectonic and volcanic activity that gives just a tiny insight into the world that existed millions of years ago. The hundreds of ocher stained streams and rocks and the magnificent emerald, green and blue lakes, stretch for hundreds of square kilometers. Downwind, the strong smell of sulfur wafts through the air. There are no “sinus” blockages in Rotorua. Note: The New Zealand Travelogue series is from a tour Lynn and I made just before Christmas 2009. First posted live to Facebook it is being reposted here along with more photographs taken during the trip. 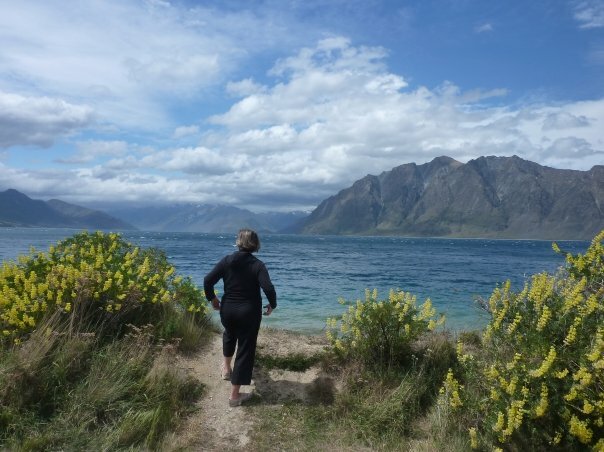 We have been told that New Zealand is a kaleidoscope of ever-changing scenes and our first three days touring the coastal route north from Auckland to Paihia, then across the top to the West Coast and Tasman Sea, provides ample confirmation. Along the “car rally” coastal route, new and stunning vista’s greet us as we round each curve and top each hill. Finding a safe place to stop to grab a few pictures is a challenge as their are few road-side view points. Even at that, Lynn is beginning to think I am going to wear out my camera before we even get started. It is indeed a good thing I bought that extra 8 gig card and spare battery.